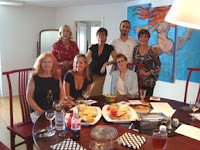 Fellow Pat Kaufman, a writer and visual artist, opened her home in Sarasota Saturday for a Florida Fellows Reunion, with the VCCA's Hannah Hanford, Director of Advancement, present as well. Fellows Jose Yulner Diaz, Jenna Ohnemus, Nicole Mary Kelby, Su Bryon, Ann Corcoran and Joyce Ely-Walker (pictured here with their host) attended. When the VCCA staff is on the road, we like to organize reunions wherever our travels find us. Thank you, Pat, for hosting this one. VCCA is saddened to report the death of composer Dina Koston. VCCA composer and friend Anne LeBaron wanted us all to know that VCCA was a very important, very special place for Dina, who was in residence at VCCA 14 times between 1997 and 2007. Throughout her career, Dina’s work was widely commissioned and performed in the United States and abroad. A entire concert of music by Dina Koston was performed December 11, 2005, in Zankel Hall, the new chamber hall of Carnegie Hall, as part of the 20th anniversary celebration of the Cygnus Ensemble. Dina and Leon Fleisher founded the Washington, D.C. Theater Chamber Players in 1968, named the first resident chamber ensemble of the Smithsonian Institution in 1973, and in 1978 named the resident chamber ensemble of the Kennedy Center. VCCA sculptor Robert Strini is pleased to unveil his new website, which represents four decades of art making. A visit to the site promises to please, with various historic and "in the studio" video clips and virtual tours of installations. 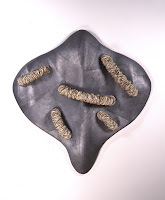 Please be in touch with Robert to learn more about his work and to stay connected with future projects and exhibitions. Robert's contact information is: P.O. Box 120, North Garden, Virginia 22959; strinir@aol.com. Visit his website at: www.robertstrini.com. VCCA Fellows John Haskell (writer, Brooklyn, New York) and Heidi Kumao (visual artist, Ann Arbor, Michigan) have received 2009 Guggenheim Fellowships that are awarded annually to assist research and artistic creation. This year, 180 Fellowships were awarded to artists, scientists, and scholars, from a pool of almost 3,000 applications. 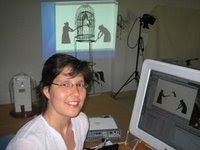 Right: Heidi Kumao at work. Visual artists Brian Counihan, Ed Doliger, and David Garratt will exhibit their work in a three-person show, "Head-on" at dialog gallery, in Roanoke, April 2 through May 16. The show opens tomorrow, April 2, with a reception from 6 to 10 p.m. The gallery is located at 18 Kirk Avenue in downtown Roanoke. 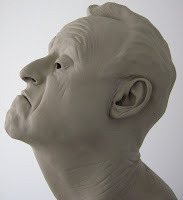 Image: David Garratt, When Things Are Heard, life size, fired clay, 2008-2009.